CHILDREN WHO ARE HURTING NEED SOMEONE TO TRUST | Connecting with You! John sits with his shoulders slumped, head bent, tears streaming down his face and with a voice filled with pain says, ‘The day my dad left my whole world fell apart and I can’t put it back together.’No, he can’t put it back together, but when Jesus becomes the centre of his life he can know and experience the wonderful love of a heavenly Father who is bigger than any circumstance or hurt. God will see him through, lift him up, support and hold him. God’s Word – the Bible – tells us that he will be a father to the fatherless and their helper (Psa. 68:5, Psa.10:14), that even if our own father and mother forsake us, he will lift us up (Psa. 27:10). We need to hear the cry of a hurting child; we must reach them. This is what our task of those in kids’ ministry and pastoral leadership must be: Reaching out to children with love and understanding. We need to be our God’s hands and feet, his eyes and ears, and his mouthpiece, to pour out words of comfort and encouragement. We need to let kids know that our heavenly Father has not abandoned them, that he has brilliant plans for their lives. That he is interested in them personally, that they truly can be champions with his help and guidance. For years my husband Ken and I have listened to the heart cry of these little ones as they try to adjust to circumstances beyond their control. Often people have the mistaken idea that children will bounce back, that they are flexible, that they will get over it. But we discovered these children were not bouncing back, they were not getting over it. Many were finding even the everyday tasks of life overwhelming. We are listening here to the cry of a little girl who feels that she has been abandoned and left to cope alone without hope. The greatest gift we can give such children is our time. Time to listen and really hear their pain. Time to give words of encouragement and comfort. When these children need their parents the most, they are not emotionally available to them due to the trauma of their own pain and suffering. Even when we give children all the ‘right answers,’ they may still feel unsatisfied because explanations touch only the intellect. Deep emotional needs call more for tenderness and concern than facts and logic. Words are not enough – many kids need a hug! We need to be appropriate and careful, yes, but let’s not be so bound that we can’t give an encouraging hug of their shoulder or a gentle pat on the back that communicates sincere concern. Studies have shown that when therapists touch their adult clients in non-threatening ways, they are more responsive to therapy. Likewise with kids. We should be God’s arms reaching out with his love. Kids know how to read a loving touch! Even a simple phone call to ask how they are getting on also lets the child know someone cares and is interested in them personally. Most of the children we have worked with in this area have had little or no knowledge of Jesus and his love. For many children’s workers, leaders and ministers it will be the same. To these children we are the face of our God, we are his hand extended. Eye contact too is so important. This leaves no doubt in the child’s mind about whether he or she has your full attention. Some of you might be searching for material to help you in this very important area of ministry, as we were. 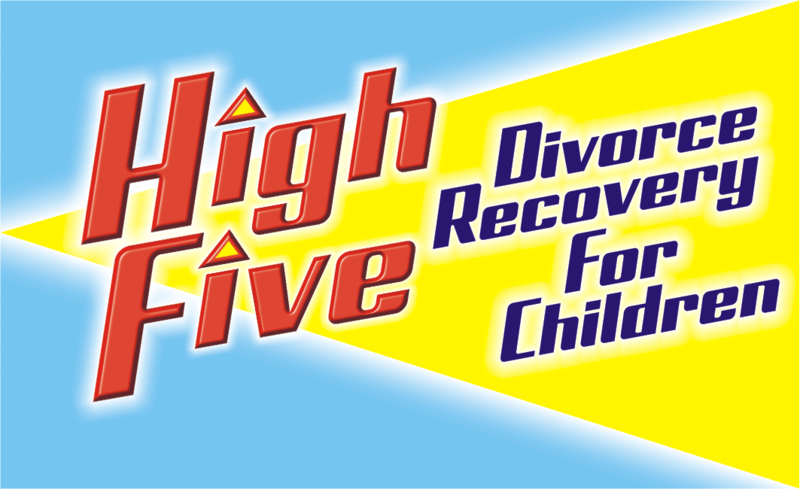 After failing to find appropriate material the Lord lead us to write our High Five Divorce Recovery Program For Children. This High Five Program was specifically written for children who are struggling to come to terms with the enormous changes that have taken place in their lives; changes due to the breakup of their family. The program seeks to begin the process of reaching out to these children with relevant material designed to confront some of the issues and questions specific to their needs. If you have ever counselled kids, you will know that you can go crazy trying to get them to talk to you. You sit there, and you know what is wrong with them because a parent has told you. But they don’t talk! Knowing this, the High Five program uses stories depicting actual situations they may find themselves in, exploring feelings and fears that they may have. It then becomes much easier for children to respond and open up. They can see that others feel and react just like them. You too can make a huge difference in the life of a hurting child just by being available to be interested in them and the circumstances that affect their lives.